Create users in AD, Exchange, Office 365 and G Suite at once, at the desired time, completely hands-free. Manage users' group memberships automatically; set conditions to auto-update users' group memberships accurately. Identify and delete inactive, disabled and expired user accounts periodically, without human intervention. Active Directory administrators are forced to spend most of their time performing repetitive tasks. Most often than not, they have no other option except Microsoft's native tools or PowerShell to perform those tasks, making AD management quite cumbersome and error-prone. ADManager Plus' automation, on the other hand, saves admins' valuable time and effort, and enhances their productivity. Besides error-free execution, it also allows offers the flexibility perform any AD task automatically at the desired time, just once, or every hour, day or week. branch needs them, creating multiple user accounts, all at once, is turned into an effortless and completely hands-free activity. the list of user accounts to be modified. specify how often the automation should run. Choose from categories such as user, computer, group, and contact automations. Automatically unlock users, disable inactive computers, and more. Automate entire routines involving a series of tasks. Configure an automation policy to define the sequence of tasks and when each of these tasks should be executed. Enforce a review-approval based workflow to exercise greater control over the execution of automated tasks. With ADManager Plus, we can grant a non-stop process to our organization and this is great. Moreover we gain costs and time in managing Active Directory. Now all is automated and none of these activities needs to be checked daily. ADManager Plus has become part of our organization. We are an IT outsource company, for our monthly reporting and audit purposes we needed to draw scheduled reports as well as be able to make bulk changes. ADManager Plus has automated many manual processes and reduced risk of incorrect reporting formats .It was able to provide the answers we specifically sought from a reporting and audit perspective. ADManager Plus is just the best. ADManager Plus has the best look and is easy to use. Now we are able to generate report and send them automatically to directors. 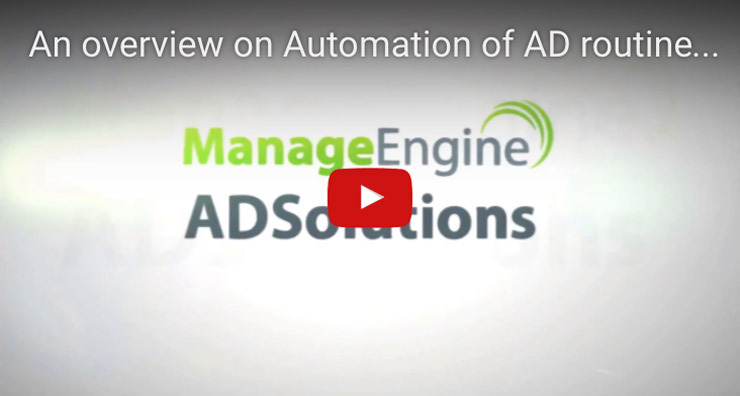 Experience how ADManager Plus’ automation simplifies Active Directory management.